Uvex Children's Skiing Goggles. Condition is Used. Any questions, please message. Enero ‘Adult’ Unisex Ski Goggles Black - UV400 Protection - Brand New Boxed. Excellent Condition with only minor scuffs. Ideal for ladies and teenagers. Lens: Single Goldlite S1 Antifog. Why buy from Chelston Direct. Uvex Ski / snowboard Helmet Cat 2 BNWT. Condition is New with tags. Category 2 protection - recommended for ski and snow sports. 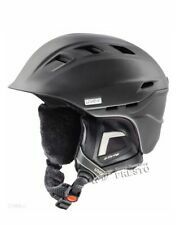 Fits head circumference 51-55cm, Black helmet colour. Back strap for goggles, vents at the top for breathability and size adjustable to ensure head is secured tightly with the helmet. Outer cardboard box slightly damaged, helmet has never been used and selling due to duplicate purchase. The lush over-sized uvex skyper goggles just look fantastic. Colour: Red. 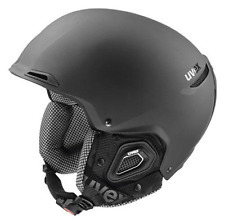 Uvex Comanche 2 Ski Helmet, KSD700 51-55cm, Black RRP £90 Women’s Ski Helmet. Condition is New with tags. Dispatched with Royal Mail 2nd Class. The lush over-sized uvex Downhill 2000 full mirror goggles just looks fantastic. Double lens spheric. Why buy from Chelston Direct. Why buy from us. Colour: Black/Silver. Uvex Goggles. Approx 21cm around the front lens with adjustable. The Hospice aims to bring peace, comfort and dignity to patients and families facing the crisis of serious illness. Colour: Black/ Green Mirror. Double spheric lens. The combination of progressive edge look and the poppy new colors is the perfect eye catcher. The uvex snowstrike FM combines the newest technologies and gives you the best view with every condition. The uvex classic with a full mirror lens: uvex downhill 2000 FM has a stylish mirror lens, for extra protection from infrared rays. Black with Blue Mirror lens. Why buy from Chelston Direct. The Tomahawk Ski Snowboard Goggles from Uvex features Why buy from Chelston Direct. Black with Silver Litemirror lens. Why buy from Chelston Direct. UVEX Ski Goggles. Ex Army surplus. The lush over-sized uvex Downhill 2000 full mirror goggles just looks fantastic. Double lens spheric. Why buy from Chelston Direct. Why buy from us. Colour: Black/Green. 100% UVA-, UVB-,UVC Protection: Protects the eye from all harmful UV rays. Suitable for: Freeride, Park and Pipe, Racing. The uvex classic with a full mirror lens: uvex downhill 2000 FM has a stylish mirror lens, for extra protection from infrared rays. Lens: Blue Mirror. Why buy from Chelston Direct. The visor is a Litemirror silver lens on a Lasergold Lite (S3) lens which removes harsh glare and distracting reflections while protecting the eyes from UVA and UVB rays. The anatomical closure button is smooth and simple to use and the Fast Adapting System webbing can be easily adjusted and they stay secure for a precise fit. Uvex Cevron Goggles. Ski goggles snowboard UVEX Anti-fog. Double lens spheric construction Improves anti-fog performance; All lenses provide 100 % UVA, UVB and UVC protection. Uvex Speedy Ski Goggles. Lens: Single Gold S2 Antifog. 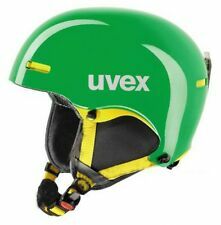 Uvex aims to give everybody the best possible protection - for sports, leisure or in the workplace. Changed your mind?. This does not affect your statutory rights. Available in black colour. In Excellent Condition - Like New, no signs of use. 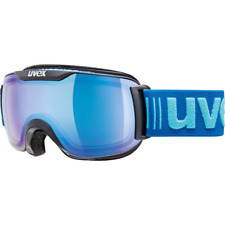 Top quality Uvex Snowcat ski goggles to fit a large child or small adult. These goggles are gold tinted with a black surround and comfortable adjustable strap. They have been used on a couple of short skiing holidays and are in good condition. Double lens spheric. easy to clean. Uvex Downhill 2000 Goggle Matte Black Full Mirror Blue Clear Lens. Condition is New with tags. Dispatched with Royal Mail 2nd Class. Activity Types: Ski. Lens colour: Pink. Lens technology: Mirror. Watches2U have now been in operation for over 15 years and have a wide range of different great value products. Fit: Small. Buy It Now: £89.95. 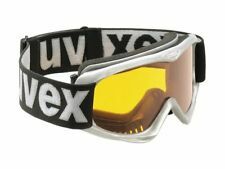 Uvex Downhill 2000 FM Goggle - White Mat. The lush over-sized uvex Downhill 2000 full mirror goggles just looks fantastic. This model is also suitable for prescription eyeglass wearers. Colour: Black. 100% UVA, UVB, UVC protection. Double lens spheric. Extra infrared protection. Easy to clean. Why buy from Chelston Direct. For long-lasting fog-free vision and cloud-free skiing pleasure. Double Lens. Colour: Black. Why buy from Chelston Direct. Cutting edge: uvex athletic FM has an eye-catching design, extra-wide field of view and mirrored lens. With know-how from the Alpine Ski World Cup uvex engineers have developed a goggle, whose edgy look causes a stir. UVEX Ski Goggles. Good condition lenses in the goggles 1x new spare lens. Ex Army surplus. Uvex comanche take off ski goggles with the brilliant, multiple award winning uvex multi lens technology. The uvex comanche take off, which is suitable for prescription eyeglass wearers, also comfortably fits small heads. The lush over-sized uvex Downhill 2000 full mirror goggles just looks fantastic. Decentered lens technology, distortion-free vision - distortions and curving in the field of view can easily lead to confusion on the slopes. Colour: Matt Black/Lite Mirror Silver. The dark lens can easily be removed and attached again to the double base lens in a split second in case the weather condition changes. Lens: Litemirror silver / lasergold lite. It protects 100% from harmful UVA, UVB and UVC rays. An extra bonus: uvex comanche VLM is an OTG goggle, which makes it perfect to wear over prescription eyewear. The combination of progressive edge look and the poppy new colors is the perfect eye catcher. The uvex snowstrike combines the newest technologies and gives you the best view with every condition. Lense: Double Variomatic Red Cat1-3. Ski/Snowboard goggles UVEX VISION OPTIC OTG /Over the glasses/ NEW !! !